Related video report by White House correspondent Aru Pande, traveling with President Obama. As he concluded his visit to East Africa Tuesday, U.S. President Barack Obama spoke to African leaders in a wide-ranging speech that touched on many of the continent’s most pressing issues. Obama’s visit to Kenya and Ethiopia culminated Tuesday with a speech at the African Union that called for change, especially among the continent’s cast of long-serving leaders. But, he noted, Africa has changed in his lifetime, from a continent of despair and dependence and into one of hope and progress. 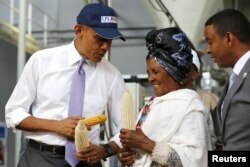 U.S. President Barack Obama (L) speaks with a farmer (2nd R) participating in the Feed the Future program as he tours the Faffa Food factory in Addis Ababa, Ethiopia July 28, 2015. Development was a focus of discussions with Ethiopian leaders, and on Tuesday, the president visited a local food factory to see how U.S. development projects have affected Ethiopians’ lives. He smiled and hugged farmer Gifty Jemal Hussein as she told him how access to better seeds improved her corn crop, allowing her to buy a cow, send her children to school and build a better house. One of Obama’s development initiatives, Feed the Future, focuses on small-scale farmers. The idea, he said, is to work more intelligently with donor funds. “With just a few smart interventions, a little bit of help, they can make huge improvements in their overall yields,” he said. In his speech, he also noted that Africa’s positive progress can also lead it astray. Speaking in the lavish, $200 million African Union headquarters, which was built and financed entirely by the Chinese government, he took a subtle jab at the Asian country’s rapid expansion on the African continent. US President Barack Obama (L), alongside African Union Chairperson Nkosazana Dlamini Zuma (R), arrives to speak about security and economic issues and US-Africa relations in Africa at the African Union Headquarters in Addis Ababa, on July 28, 2015. 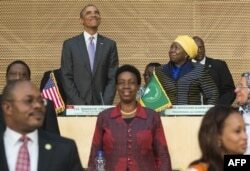 Time will tell what effect Obama’s words will have on his counterparts in Africa. But his tour of Kenya and Ethiopia has generated widespread public approval. That was clear by the warm reception he’s received by crowds in both countries. Judging from the audience’s ecstatic response, laughter and applause, he might have a shot here in Africa.